The Kolun is undergoing tests and waiting for its first customers. In addition to the formidable-looking Karatel armored car, the Russian armed forces may soon receive two more advanced combat vehicles. Several new armored vehicles have been designed in Russia in recent years for the needs of the armed forces and the Federal Security Service (FSB). They are still being tested but they have already been shown to President Vladimir Putin. RBTH looks at the three most unusual combat vehicles that appear to have made an impression on the Russian leader. This all-terrain combat vehicle with a futuristic look that FSB director Alexander Bortnikov showed to Vladimir Putin on Feb. 26 bears a name with somewhat painful associations for a Russian mind: karatel is the Russian for punisher, the name given during World War II to Nazi Germans who killed Soviet civilians. With a look that is reminiscent of the famous Batmobile from the Hollywood blockbusters, the Karatel is a formidable off-road vehicle designed for secret units on special operations. The first photographs first appeared back in early 2012, when some bloggers spotted the new vehicle at a testing range outside Moscow. Reports at the time said that the 12-ton vehicle had been built on a KAMAZ chassis and the shape of its body was intended to better protect the vehicle against explosions. The Karatel could therefore be described as a counter-sabotage vehicle. For an armored car, the Karatel has an impressive speed of almost 70 mph, while its flank armor is capable of withstanding 7.62-mm caliber bullets (like those used, for instance, in the new Kalashnikov assault rifle). When undamaged, its armored windows can take a hit from a rocket-propelled grenade. The seating arrangement inside is also quite unusual for Russian combat vehicles in that paratroopers (the Karatel can comfortably accommodate 10-12 people) sit back-to-back, allowing them to have a panoramic view and fire in all directions. Clearly, nearly four years of testing have done the Karatel only good: The vehicle has been shown to the Russian president, which can only mean that it now has every chance of coming into service in the near future. Another armored vehicle of the future appeared almost out of thin air. Designer Oleg Shapkin drew it for a 2014 competition, “Combat Transport Vehicle of the 21st Century.” It did not take long for the drawing to come to life. The angular-looking vehicle was built on the chassis of the civilian ZIL-131 truck in late 2014. The Kolun has two modifications, a 6х6 and a 4х4 option, and weighs 9 tons. It is fitted with landmine and bullet protection. Its designers expect that the vehicle will be used as an armored personnel carrier (it can accommodate up to 16 people). The Kolun is undergoing tests and waiting for its first customers. A younger brother to the Kolun, the Toros is another brainchild of Oleg Shapkin. It too is built on a ZIL chassis. 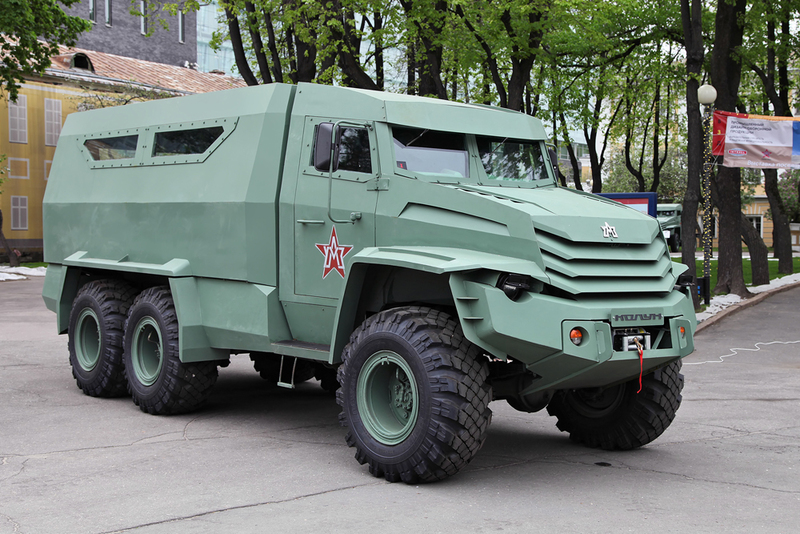 The Toros has the same level of protection and armor as the Kolun and comes in three varieties: as a commander’s open-top vehicle, as an amphibious vehicle, and as a medical vehicle. The Intrall company, which has manufactured the vehicles, admits that so far it has not received orders either from the Defense Ministry or other government agencies, although interest in these unusual vehicles has been expressed (including from abroad). Vladimir Putin has also shown an interest in these “polite” combat vehicles (nicknamed thus as an allusion to the popular name given to Russian servicemen and military units that were involved in the Crimea operation in 2014).